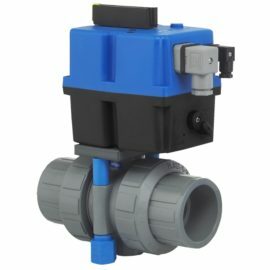 Electrically Actuated Ball Valves – Plast-O-Matic Valves, Inc.
2-way Series EBVF is a premium multi-voltage actuator with automatic voltage sensing, featuring rugged glass-filled polypro construction for corrosive atmospheres. Includes manual override, LED status light, electronic over-torque protection, thermally protected motor, anti-condensation heater, CE Marked, IP-67 water and dust proof enclosure. 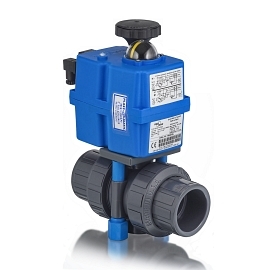 Options include Fail-Safe battery back up, 4-20 mA/0-10 VDC digital positioner for control valve applications with characterized profile ball designs. Has simple connections for remote operation and position indication. Now available 3/8″ through 4″ sizes; PVC, CPVC, Polypro or PVDF. 3-way Series TEBVF provides the same premium actuator features in 3/8″ through 2″ sizes with 2-hole or 3-hole ball in PVC or CPVC; 3″ & 4″ sizes with 2-hole ball in PVC, CPVC, Polypro or PVDF.